I discovered this temporary light sculpture in a park in Austin, Texas and had to take a video. I was wearing diffraction glasses and tripping on shrooms, so every source of light exploded into a dazzling spectrum of colors. The effect was magical, as though the tree was scrawling across the sky with bright and fiery fingers. The music completed the experience. Nodding my head to the Geographer song playing in my headphones (“Paris”) and watching the colors drift across my vision, I had one of those moments. You know the ones, where the scene is so perfect that you are struck speechless, wondering how can life contain moments this beautiful? I must be in a movie, right? No way scenes like this happen in real life. Naturally, I took a video with diffraction glasses over the lens, and took note of the song that had captured the moment with such perfect serendipity. So here it is, complete with audio! My favorite clip is 0:18 – 0:28, where the warm colors ooze across the dark sky. As the mind wanders, the tree-shaped tubes of light can become anything. A brain’s neural network lighting up with activity, or information traveling along the pathways of the Internet? Perhaps the ebb and flow of a river as it courses through the delta at its mouth, the centuries of erosion and adaptation compounded into mere seconds? It’s up to your imagination. As always. 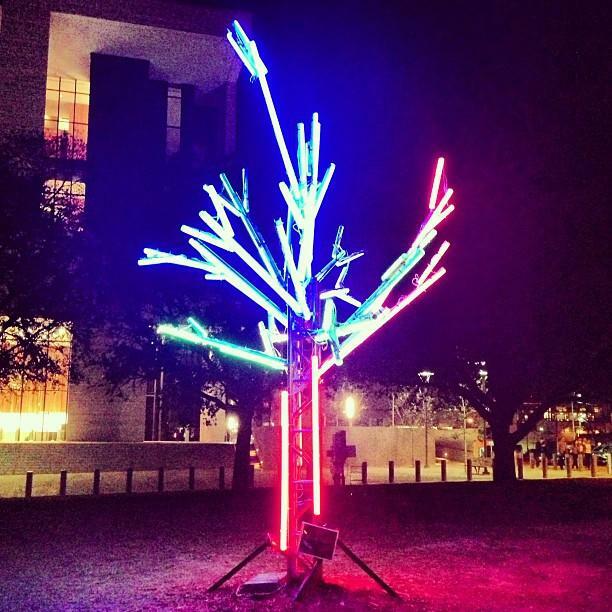 The sculpture was exhibited as part of a series of art installations called the “Garden of Light” in Austin’s Republic Square Park, presented by South by Southwest Eco in partnership with Austin Parks and Recreation. I didn’t take any still images of it, but I found a picture on Twitter that gives you the idea. It’s much more impressive in real life (not to mention with diffraction glasses and psilocybin).